Jerod Mayo Sr (born February 23, 1986) is an American football coach and former linebacker who spent his entire National Football League (NFL) career playing for the New England Patriots. He played college football for the University of Tennessee. Mayo was drafted by the Patriots tenth overall in the 2008 NFL Draft, and was named the 2008 AP NFL Defensive Rookie of the Year. Mayo was born in Hampton, Virginia. He attended Kecoughtan High School in Hampton, where he earned three letters in football as a linebacker and a running back. As a senior, Mayo recorded 110 tackles, including 18 for loss, and two interceptions. Also playing running back for seven games, he picked up 1,245 rushing yards and scored 13 touchdowns and five two-point conversions during his final campaign. As a junior, he recorded 68 tackles including 22 for loss, four interceptions and three sacks and earned first-team All-District, All-Area and All-Region honors. Considered a four-star recruit by Rivals.com, Mayo ranked eleventh among outside linebackers nationwide. He chose Tennessee over North Carolina State, Purdue, Virginia, and Virginia Tech. Jerod's younger brother, Deron Mayo is a linebacker for the Calgary Stampeders of the Canadian Football League. While attending the University of Tennessee, Mayo played for the Tennessee Volunteers football team from 2004 to 2007. After redshirting the 2004 season, he appeared in six games at weak-side outside linebacker in 2005, finishing with 13 tackles (10 solo). Mayo made the Volunteers starting lineup as a redshirt sophomore in 2006, as he started 11 contests at weak-side outside linebacker. He finished third on the team with 83 tackles (48 solos), including five sacks for minus 40 yards, 12.5 stops for losses of 51 yards and a quarterback pressure. He also recovered one fumble and deflected a pass. Rivals.com subsequently named him to their All-American second team. For his junior season, Mayo moved to middle linebacker and started all 14 games. Serving as the defensive squad's co-captain, he went on to register 140 tackles in 2007, the most by a Tennessee defender since Earnest Fields registered those same totals for the Volunteers in 1990. He added 1.5 quarterback sacks for minus 11 yards, 8.5 stops for losses and five quarterback pressures, and also returned an interception 34 yards for a touchdown. Mayo was a first-team All-Southeastern Conference selection and also earned All-American second-team honors by The NFL Draft Report. Mayo was considered one of the best linebackers available in the 2008 NFL Draft and drew comparisons to Will Witherspoon. Sporting News described Mayo as a “perfect fit to play one of the inside spots” in a 3-4 defense. The New England Patriots selected Mayo in the first round (10th overall) of the 2008 NFL Draft. Mayo was the second linebacker drafted in 2008, behind Keith Rivers. On July 24, 2008, the New England Patriots signed Mayo to a five-year contract (rather than the six-year maximum allowed by the NFL's collective bargaining agreement) worth $18.9 million, including $13.8 million in bonuses and guarantees. Mayo was the only rookie in the Patriots' 2008 class to start in Week 1, and played every snap for the defense. Mayo was named the NFL's Defensive Rookie of the Month for October 2008. He led the Patriots with 24 tackles for the month, including 11 against the Denver Broncos in his first Monday Night Football appearance. In the Patriots' Thursday Night Football game on November 13, 2008, against their division rivals, the New York Jets, Mayo led all defensive players with 20 tackles (16 solo, 4 assisted), the first 20-tackle game of his career. Mayo was injured in the Patriots' 2009 season opener against the Buffalo Bills. The sprained MCL in his knee was originally expected to keep him out 6–8 weeks, but he returned in Week 5 against the Denver Broncos. Mayo finished the 2009 season with 103 tackles and 1.5 sacks. In 2010, Mayo was named a defensive captain. In Week 4 against the Miami Dolphins, Mayo recorded 16 tackles, and two weeks later notched 18 tackles in an overtime win over the Baltimore Ravens. In Week 8, Mayo recorded 14 tackles in a win over the Minnesota Vikings. Against the Indianapolis Colts in Week 11, Mayo recorded 15 tackles in a win. In Week 12, Mayo's eight tackles gave him 132 on the season, surpassing his previous career high of 128, set in 2008. He added another 12 tackles in Week 13 against the New York Jets, and had 16 in Week 15 against the Green Bay Packers. He ended the season with a league-high 175 tackles, along with two sacks and one forced fumble. He was named as a reserve to the 2011 Pro Bowl on January 2, 2011. In the same season he was named to the 2010 All Pro team. On December 17, 2011, at the beginning of Week 15, it was announced that he had signed a 5-year contract extension with the Patriots. In 2011, he missed 3 games due to injuries but still managed to eclipse the 100-tackle mark. Mayo and the Patriots reached Super Bowl XLVI. In the game, Mayo had 11 tackles but the Patriots lost to the New York Giants by a score of 21-17. He was voted a defensive co-captain by his teammates for the fourth straight year. On November 16, 2012, Mayo was fined $10,000 for a late hit out of bounds on Week 10 against C. J. Spiller with the Buffalo Bills. This drew an unnecessary roughness call. Later in the year, he was selected in the 2013 Pro Bowl in recognition of his successful 2012 season. Mayo was placed on injured reserve on October 16 after tearing his pectoral muscle on October 13 in a Patriots comeback win against the New Orleans Saints. On October 16, Mayo was placed on injured reserve with a torn patellar tendon that he suffered in a game against the Buffalo Bills in Week 6. Without Mayo, the Patriots won Super Bowl XLIX after they defeated the defending champion Seattle Seahawks by a score of 28-24. Mayo's playing time dipped in the 2015 season, being behind Dont'a Hightower and Jamie Collins on the depth chart. On January 19, 2016, days before the AFC Championship against the Denver Broncos, Mayo was placed on injured reserve with a shoulder injury. 2015 was the third consecutive year his season ended early. On February 16, 2016, Mayo posted a message on his Instagram account announcing his retirement, thanking the Patriots for the previous eight years. On March 27, 2019, Mayo was hired by the New England Patriots to be their linebackers coach. Mayo is married to Chantel Mayo. The couple have three daughters and a son. The family resides in North Attleborough, Massachusetts. Mayo has two brothers, both of whom played college football. His younger brother, Deron Mayo, plays in the Canadian Football League, and his brother Derek Mayo is a graduate of Richmond. Jerod, Deron, and Derek Mayo are all linebackers. Derek's Richmond team won the NCAA Football Championship Subdivision title in 2008. ^ "Outside linebackers 2004". Rivals.com. January 25, 2004. Retrieved May 7, 2009. ^ a b c "Jerod Mayo". CBS Interactive. Retrieved December 26, 2013. ^ a b "Pro Football War Room: Jerod Mayo Profile". Sporting News. Retrieved May 26, 2009. ^ "2008 NFL Draft Listing". Pro-Football-Reference.com. Retrieved December 16, 2017. ^ Gasper, Christopher L. (July 24, 2008). "Top pick Mayo signs with Patriots". The Boston Globe. Retrieved August 4, 2009. ^ Reiss, Mike (September 10, 2008). "Defensive snapshot". Boston.com Reiss' Pieces. Retrieved August 4, 2009. ^ a b c d e f "Jerod Mayo". New England Patriots. Archived from the original on December 27, 2013. Retrieved December 26, 2013. ^ "Mayo is AP's Top Defensive Rookie". Associated Press. ESPN.com. January 1, 2009. Retrieved August 4, 2009. ^ Gasper, Christopher L. (September 16, 2009). "Mayo has a sprained MCL". The Boston Globe. Retrieved October 12, 2009. ^ Reiss, Mike (September 10, 2010). "2010 captains: Brady, Faulk, Mayo & Wilfork". ESPNBoston.com. Retrieved October 28, 2010. ^ "Source: Pats extend Jerod Mayo's deal". ESPN Boston. December 18, 2011. Retrieved December 26, 2013. ^ "Fines roundup: Tim Dobbins of Texans fined for Jay Cutler hit". National Football League. November 16, 2012. Retrieved November 16, 2012. ^ Howe, Jeff (October 16, 2014). "Report: Jerod Mayo underwent surgery on patellar tendon". The Boston Herald. Retrieved October 16, 2014. ^ "Jerod Mayo". ESPN. ESPN Internet Ventures. Retrieved September 3, 2014. ^ O'Malley, Nick (March 27, 2019). "Jerod Mayo returning to New England Patriots as linebackers coach". masslive.com. Retrieved March 27, 2019. ^ Sarie (October 8, 2013). "Jerod Mayo is a Family Man". Black Celebrity Kids. Retrieved December 26, 2013. 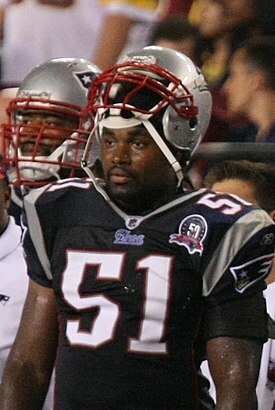 Wikimedia Commons has media related to Jerod Mayo.